Whether you want to coordinate with the other parents on your kids' soccer team or join a book club, Yahoo Groups is a great place to connect with people from all over the globe. A picture is worth a thousand words. Group photos allow you to share and view topic-specific albums from fellow members. Settings let you to moderate who can add to your collection. Polls are a great way to survey the opinions of your fellow group members. Ask anything and get results in real time! If you want to protect members privacy, hide voter identity through the poll settings. We know life's busy so stay organized when it comes to planning events. 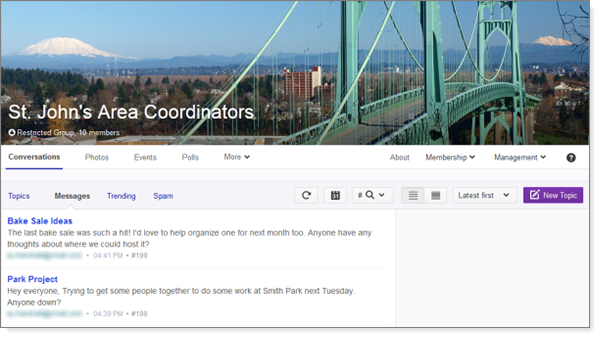 Coordinate meet-ups and to-dos with the rest of your group using the community calendar. Express yourself! Post, view, or participate in conversations open to all group members. Instantly upload files and share links with the rest of your group. Create phonebooks, inventory lists, music libraries, and more through collaborative database templates.